I have to admit, when Jules sent through the URL to a new little project he was working on, I didn’t quite get it. We’ve both had a taste for fiddling around with phone-based apps long before they were hip — or even vaguely practical for that matter — so when he devised this little free mobile service, it wasn’t surprising he IMed the URL through to me. Arriving at the site for the first time, there’s not a lot to look at. A textbox, two radio buttons and a submit button. My initial impressions were ‘TinyURL in cool hipster pants’. The service appeared to convert long and nasty URLs into short and pretty URLs that are easy to pop into your phone. Hmmmm… ok, ok.. But these short URLs auto-expire quickly — at the most, 48 hours after creation — making them not much use as bookmarks. And if you’re sitting at a computer to enter these URLs, why would you be bothering with your tiny phone screen? I shrugged and move on. About two days later I was experimenting with the VICRoads live traffic site and Yahoo Pipes, trying to figure out the most effective way to get only the freeway travel times I needed to my little Nokia. While it’s easy to sit there with your text editor, Firefox, Firebug and dev tools cranking away, when it comes to testing it on the average phone, things are remarkably difficult. Sure, you can peck away at your keypad like a chicken having an anxiety attack, but make one mistake and it’s wait 30 seconds before starting from scratch. Surely, I thought to myself, there must be a little app somewhere to bluetooth a URL from your browser to your phone? Apparently not. Perhaps there is, but I couldn’t find one. That’s precisely where Pa.am fills a gap. Firstly, Pa.am’s URLs are designed for this development and testing cycle, so their lifespan is not an issue. The key trick that Pa.am has over your traditional TinyURL services is the format of it’s URLs. Pa.am URLs are constructed entirely from the ‘single key press’ characters. This means that entering the five characters of the Pa.am URL is only ever five keystrokes. Similarly your URL is identified by three more single key press letters after the slash. Of course, what this effectively means is you can take a URL of any length and containing any combination of legal characters and get it into your phone with only eight key strokes. Ah,… ok, I was a bit slow on the uptake, but I get it now! Nice work, Jules. 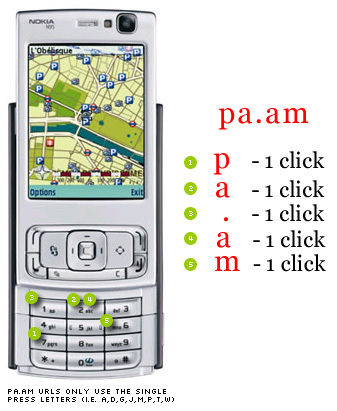 Anyway, if you have a penchant for fiddling with the mobile web, give Pa.am a go, and let him know what you think.